CLEVELAND, Ohio. 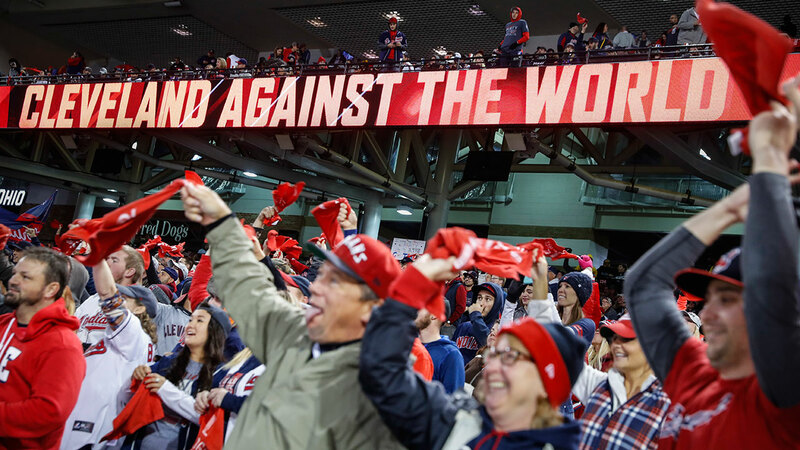 -- The crowd at Progressive Field tonight will be charged up to see the Indians claim their first World Series title in Cleveland since October 12, 1920. That's when Stan Coveleski's five-hitter led Cleveland over Brooklyn 3-0 at League Park for a 5-2 win in the best-of-nine World Series. Game 6 tonight against the Cubs finds Cleveland getting a second straight shot at wrapping up their first Series title since 1948, while extending Chicago's streak without one to 109 years. Cleveland goes with Josh Tomlin, who pitched 4 2-3 solid innings in Cleveland's 1-0 shutout at Wrigley Field in Game 3. The Cubs try to stay alive and force a Game 7 behind Jake Arrieta (ar-ee-EH'-tuh), who took a no-hitter into the sixth inning of Chicago's Game 2 win. Tuesday night isn't the first time Indians manager Terry Francona has been looking for a little bit of magic in Game 6 of a World Series. Francona joked that he once won a stash of cash when Boston Red Sox catcher Carlton Fisk hit his famous home run off the foul pole in the 12th inning of Game 6 of the 1975 World Series to give the Red Sox a 7-6 win over the Cincinnati Reds, forcing a Game 7. Francona says that when the ball hit the foul pole, he "went bananas." When his father mentioned that he didn't know his son was a Red Sox fan, Francona replied: "I'm not. I had the (final score) at school. I won $100."